Published by the American Bar Association (ABA), Personal Finance for Professionals explains the basics of budgeting, living debt-free, dealing with student loan debt, how to use credit to your advantage, how to calculate how much rent or mortgage payment you can afford, the ins and outs of insurance, the basics of investing, paying taxes and dealing with the IRS, and the first steps toward retirement planning. As a young professional, you probably face an interesting set of financial challenges. You now earn – maybe for the first time – a good salary, but you also face substantial debts and obligations such as rent, car payments, and student loan payments for the first time, too. On top of that, you know you should probably start putting money aside for retirement. Plus, you've heard you should have a rainy day fund in case something goes wrong at work. And one day you'll want to start a family, shouldn't you start preparing for that, too? Suddenly, that new salary doesn't seem so high anymore. Luckily, Susan Berson will help you sort through all these complex issues and find solid, long-term solutions that make best use of your money. 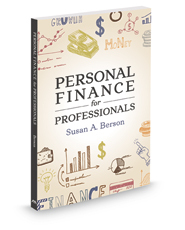 You'll answer all your financial questions, and master all the new financial problems faced by most young professionals, in this practical, useful guide.